NOTE: If you need help with AdSense, you can always ask at the help forum here. So I’ve just picked up my Google AdSense income today and I’m pretty happy with the exchange rate I got. The exchange rate for USD to MYR is quite promising in 2016. I’ve been a publisher since 2009. Even though I no longer focus on make money with Google, but they never failed to pay me on time in the last week of each month. If you’ve never heard of AdSense or wonder how it works, click here to find out more. Nevertheless, a common question that I often get asked from new publishers (Malaysian) is “How do I collect my Google AdSense income?” As a matter of fact, I answered that at least once (sometimes twice) in a month, either via chat or email. I remember there was once a lady waited for a month plus… not aware that her payment was already arrived. So I thought of writing it out at my personal blog and sharing it for more people to know. #1 Verify Your Address By Entering The PIN: Once your account reached the verification threshold of $10, Google will automatically generate a Personal Identification Number (PIN) and mail to your home address. You are required to verify this number. #2 Submit Your Tax Info: For Malaysians, pick Foreign publisher with no U.S. Activities. #3 Choose Your Preferred Form Of Payment: There are 3 methods available for Malaysians, i.e. Western Union Quick Cash, wire transfer, and Check. I’d highly recommend you choose Western Union because you will be able to cash out immediately once your payment is released. Also, there’s no additional fee to receive WU payments. In your account, go to Settings (Gear Icon) → Payments → Manage Payment Methods. #4 Set Your Payment Schedule To get Paid: You DO NOT want to prevent payments from being sent to you monthly. Make sure you’ve adjust the payment threshold option. In your account, go to Settings (Gear Icon) → Payments → click Manage Settings. #5 Cash Out Once Your Earnings Reaches $100.00 (USD): Once your earnings is finalized and hit $100 or more at the end of the month, Google will issue your earnings to you at the end of next month, typically around 21st-22nd of the month. You will need to note down the Money Transfer Control Number (MTCN) as well as the EXACT payment amount. 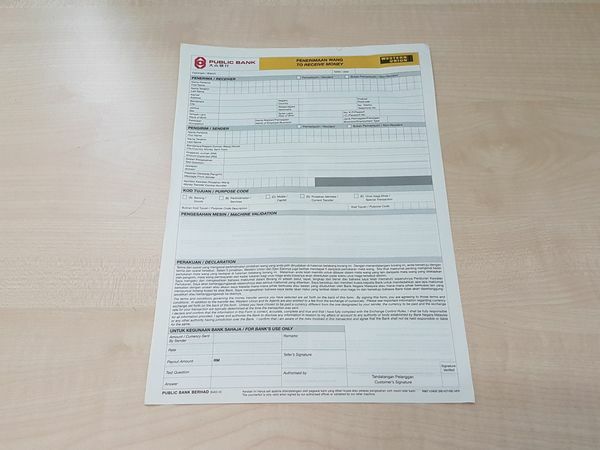 Go to the nearest bank that got a Western Union signboard (RHB, Hong Leong, Public Bank, or even POS Malaysia), fill out the Western Union To Receive Money form (yellow header – see the PBB example below), show your IC to the officer, and you will be able to withdraw your Google AdSense income immediately. I hope the info I shared here has been useful to you. Let me know what you think. I take a quick look at your site, personally I don’t feel too comfortable with the layout. E.g. The page doesn’t fit in my browser and I need to scroll to the right at the bottom. It’s hard to “please” big G nowadays and know what they really want. I suggest you asked at the AdSense official forum and let the top contributors to give some feedback. For me, I’d just suggest you change the appearance of your site. Hey Khaimun, can you show the example of how to set address??? issue my pin but my pin haven’t arrived yet! they say it would take about 2-4 weeks or even a month,but it never came..
they won’t show the ads anymore. If you’ve waited your PIN for more than 4 weeks, you can request a new one. 1) Log in to your AdSense account. 2) At the Home tab, visit Account settings page. 3) Click the ‘Verify address’ link. 4) Make sure your payment address is correct (you can change it). 5) At the bottom of the page, click Request new PIN. Two months are already gone, I’m not received my AdSense PIN Yet and i applied for a pin two times….my area postal service is good.. i don’t know Google Adsense pin send me or not.. what to do next?. I’m from Delhi, India. Is this your first account? If yes, you should post your issue at the AdSense Forum. Thank for this great tips, best guide for me. 1) Get a domain and hosting. You’ll look more reputable by having a self-hosted blog. 2) Do you use Google Analytics to monitor your traffic/visitors? See where your traffic are coming from and identify what keywords people are searching for. If you can get some of those keywords rank in top page of Google (which is not easy for competitive keywords), then you’ll instantly get lots of traffic to your blog. 3) Be everywhere. Connect your site to social media like Google+ (very important), twitter, have your own youtube channel to share videos around. That’s all I know. Bottom line: if people find something interesting/valuable at your blog, they will visit quite often and most likely will share your content with others. I am Bangladeshi. But I live in Malaysia. If I make a a new adsense ID with my Malaysian address, then is it possible to get my earnings in Malaysian bank via Western Union by my Bangladeshi Passport? If Possible….so how many fees and Malay tax they will deduct from my earnings? N.B: Its not possible to get adsense income via WEstern Union in Bangladesh. I don’t think you’re able to cash out money in Malaysia. The way how AdSense works is you can only withdraw payment (using Western Union Quick Cash) in the same country as your residency. If you registered an AdSense account in Malaysia, you need to have a Malaysian passport (or) Identification Card in order to cash out payment. Sadly, the western union payment is not available for all countries. personally, i have to wait for 21 days before my check will be cleared from the bank. Am happy for those who can withdraw their earnings through WU and Direct Bank Deposit. I already reach my payment threshold and waiting for my PIN number. But yesterday I just found out that my there’s typing error on my address. I didn’t put my full adress. I miss my some important part of my address that is my Taman. I put only “Taman” instead of “Taman Damai Jaya, Skudai”. But I included Johor Bahru and my poscode. Adsense already sent my PIN number about a week ago. So, I am worried it will not reach to my address. So, how do I check this. Do I need to go to post office to check whether they got my letter? What courier services that adsense use to send my PIN so that I can check it with the courier agency. Or do I need to wait for 4 weeks and request PIN again with the correct address. I’m really ashamed and stress after I found this out. I already reach $500 in my account and at the end of the month it will be $1000. Thanks. Hope you have any ideas to solve this. It sounds like you’ve just requested your PIN when you reach $500? There’s really no other option other than wait for a while. If you’ve never received the PIN letter, you may request to issue again in your account. Make sure your address is CORRECT this time. I’m not sure what courier service they used, but if your address is correct, it’ll be delivered in your mailbox. Where you pick up your payment? Is it the same country as your address in your AdSense account? About to receive a check from adsense . But my name is in reverse order , will i able to bank into citibank and clear ? or i have to submit a payee name change and wait for another check ? Based on you IP address, I assume you’re from Malaysia? I’ve never used check before so I’m not sure about that. My “payee name” is in the correct order. However, when cashing out payment from WU, the system displayed my “Full Name” as: Lee K, “Sur Name” as: M.
My question: why would you prefer check as your payment method? WUQC allows you to cash out instantly with no extra charges. Does AdSense still can be used even if I don’t have a bank account? No, you don’t need a bank account. You withdraw money immediately via Western Union Quick Cash option. I just read on Google Adsense Forum that EFT is now available for Malaysian Adsense Publishers. Is it true? Can you you confirm it? I don’t think so. See here: Receiving payments by EFT. I have already done steps 1-4 but how long do I have to wait for the issued payments to reflect on my account. I mean, it my just a few weeks ago, I think two weeks ago, that I was able to set up everything for the payment method. And by reading your post, would that mean that I still have to wait next month for its processing? Please let me know. I hope to hear from you. Is this your first time receiving payment? If you’ve crossed the $100 threshold end of this month, you should be expecting the payment issue to you end of next month. Thanks for responding to my comment as well, KM. I really appreciate you helping me on this. By the way, yes, it’s my first time. It has long been on my account, I mean the threshold reach, which even exceeded. So, that makes me bothered. (CHUKLE) where will it show me the notification when it arrives? Please let me know. Hi km lee my name is ashish i’m from india now i have a google adsense account that i have just made and sooner or later i would want to cash out my earnings now what are the things that i need to do, i have axis bank and western union money transfer near me what are the things i need to take with me while cashing out my cheque ad what if my cheque is delivered at wrong address can anyone cash it out? i’m quite new to this so i’ll really appreciate your advice! Frankly, I’m not familiar with India. If you’re using cheque as your payment method, I believe all you need is to make sure your name on the cheque is correctly spelled. I need your help please. How can I get ads from google adsense, if generally when i go on bring ads from google then it’s don’t work BUT why. Some guy are told me that my web is not appropriate for low article. If that’s right then please help me by good solution. And also I’m from Bangladesh . So is it possible to payment google adsense by Western Union? If you’ve an active AdSense account, your ads will be displayed on your site. Unfortunately, Western Union Quick Cash method is not available in Bangladesh. The payment we sent for your Google AdSense earnings on Dec 23, 2013 was unsuccessful. what must I do? I’m not from the Google AdSense Team. Perhaps you should ask in their official forum at here: AdSense Forum.